The CITREX H3 provides the necessary functions required to test and validate the performance of respiratory ventilators. Its compact and lightweight design make the CITREX H3 a small and powerful tool. A single integrated flow channel measures pressure, flow, volume, and oxygen concentration. The capability to calculate ventilation parameters makes CITREX H3 the ideal device to verify the performance of a wide range of respiratory devices. 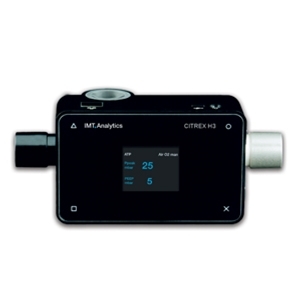 The CITREX H3 measures bi-directional flow, pressure, and temperature and optionally oxygen concentration. Gas flow is pressure, temperature and humidity compensated and can be displayed in many different gas standards. This brings additional flexibility to the user. With an internal battery, the CITREX H3 can perform measurements for many hours on a single charge. The USB power connector allows for simple recharging at any time. To expand the application range, an optional oxygen sensor, mounted directly within the flow channel, is available.